Do you have spare Bibles around home or church that you no longer use? Did you know that many pastors; Students and Individual in Africa have no Bible at all? Even tracts. Consider mailing some for the needy. 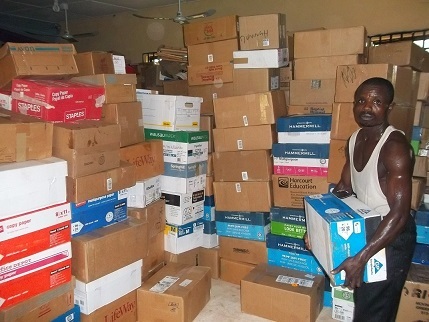 All these materials are given away freely to those receiving, individuals’ churches and pastors in Africa who dose not have one. GATHER GOSPEL MATERIALS: Help gather Christian literature in your area and ship it to us. Publication, Announcement and Church bulletin inserts can be provided to assist with the collection. MINISTRY ITEMS: Public address systems & Musical equipment, computers in working condition, Digital cameras, photo copying machines, VCR converters, stereo tape copiers & printers. DONATION: Your generous financial gift will help us purchase Bibles locally and ensure the materials get to the field in a timely manner and also to meet the need of the ministry. We will greatly appreciate any help you could give with this great need. We want the gospel to reach as many as we can. If you’ll help give, we’ll be faithful to see that it is distributed to those who need. We distributed Bibles, books for Bible Colleges and pastors, and literature to believers in poor villages. So far we have distributed into 52 villages. We distribute these materials to places where the people use English. There are thousands of people who are greatly in need of materials. Many believers in the third world have never had a copy of God’s Word. Many unbelievers are searching for the Truth, and they would like to have a copy as well. Because of their poverty they cannot afford a Bible. Give us your extra Bibles, and/or purchase a few and send to us. We also need New Testaments and Gospels of John and Romans. BOOKS FOR BIBLE COLLEGES AND PASTOR. Examples of the material we can use: Bibles, Tracts, Books; Christian books for Pastors and Bible school libraries. Literature, Hymnals & music, cassettes, DVD’s, cd’s, Devotionals, Sunday School Material, Vacation Bible School, Monthly magazines, Toys for Children, Clothes for Children and Adults, AV Equipment: Audio and video equipment, PA systems and musical instruments, Office Equipment; Computers, software, printers & copiers. Container Shipment: Sending large 40′ containers. This is of course a very effective way to ship. One of our great needs is Bibles. 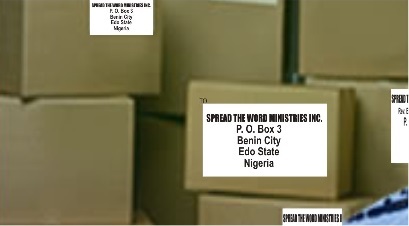 Will you please pray about what God would have you and your church do so we can get this shipment as soon as possible? We desperately need these Scriptures.